Mahates is a municipality located in the Bolívar Department. It was founded on 17 April 1533 by Spanish conquistador Pedro de Heredia. 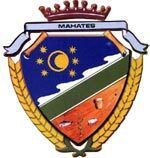 The flag of Mahates can be seen in a small image at the municipal web site. The flag is a horizontal flag with two stripes (white on top and green on the bottom, in equally divided stripes) featuring the coat of arms in the middle. It is claimed by the official website to be authored by Ever Sierra Rivera. The coat of arms official description from the website is as follows: "Sun and Moon adorn the nights at the Municipality of Mahates (in blue). Green means prosperity and fertility of the town's lands, (and) in the lower part (orange color) we see featured the distinctive energy of its people. We see (in this) the symbol for agriculture, cattle raising, fishing and its culture"
"The colours of the flag are white, representing peace and tranquility in our municipality, green symbolizing agriculture and our soils' fertility, the cattle's head and the maize plant reflecting the main sources of income of the region." This description has nearly nothing to do with the image shown on the municipal website!